In 18th-century Spain the Guillami family ran one of two outstanding workshops, the other belonging to the Contreras family. Recent intensive research in the archives of the Barcelona Guild of Carpenters (‘Gremi de fusters de Barcelona’), conducted by Joan Pellisa for our forthcoming publication The Golden Age of Violin Making in Spain, has shown that the name ‘Guillami’ can be traced back to the 16th century in Barcelona. The first person of that name who can be clearly identified as a guitar maker is Rafel Guillami. It is believed that he could be related to the subsequent Joan Guillami i Nin, although there is no documentary proof. Barcelona’s cathedral archives have suffered losses over the years from fires and episodes of looting that have made it impossible to locate Joan Guillami’s birth certificate, although several official documents point to 1699 as his official year of birth, rather than the commonly accepted 1702. With a business established on the ‘Carrer des Escudillers’ in Barcelona, Joan Guillami became a master maker in 1721 and died in 1767, as shown by the word ‘Obit’ noted in the records of the annual Guild subscriptions for that year. Joan Guillami filius would have taken over his father’s workshop after his death and since we have encountered similar problems in finding documentary evidence of Guillami filius’s birth and death dates, we will keep the widely accepted dates of 1739–1819. 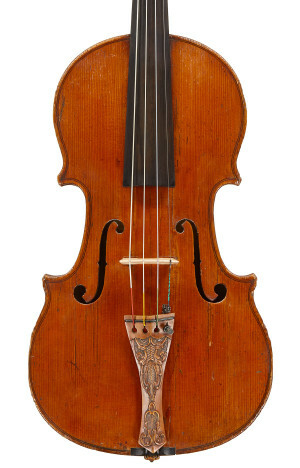 The violin shown here, made by Joan Guillami, has an original label dated 1755 and the viola, made by Joan Guillami filius, has a typical handwritten label of that period. The distinctive GVILLAMI brand, set close to the soundpost, is clearly visible in both instruments. While it has been said that this procedure was never used by Guillami filius after 1779, in fact it has been found recently in some later instruments. Both instruments are quite Italianate in construction, with classical pins in the upper and lower ends of the back and a distinctive Genoese-style scroll template that seems to have been used by both father and son throughout their working lives, not only in the violins but also in the cellos. 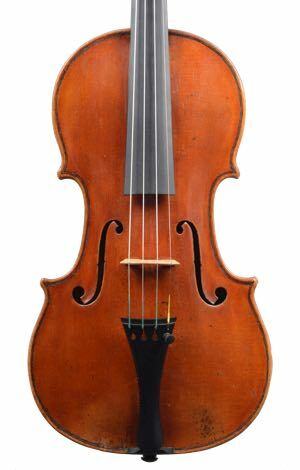 As John Dilworth points out in our forthcoming book, it is possible that Guillami could have encountered Genoese instruments and been influenced by that style of violin making since Genoa was a natural trading partner of the Iberian peninsula, and Barcelona in particular. The heavily chambered scroll, retaining traces of black stain, and the backward-leaning head with the slightly squared-off chin, help to make these makers identifiable at a glance. The soundholes are nicely cut and, in the case of the viola, we can still see the clear and strong influence of the father, with the tendency that developed in his later violas for smaller wings with a much broader appearance in general. Due to the strict regulations of the Barcelona Guild of Carpenters concerning the use of imported materials, similar locally grown species were used for the making of both instruments: two matched pieces of quarter-sawn hardwood for the backs, and bellies of fine softwood, with very dense and tight annual rings in the case of the violin. Unfortunately the results of recent dendrochronological analysis carried out on the output of the Guillami family by the expert Peter Ratcliff have proved inconclusive. The local pine timber from the Pyrenees has shown over the years a tendency to develop cracks. This is one of the reasons why very few Guillami instruments have survived to the present day in top condition, with several examples having replacement tops made later by Ignacio Fleta. The Golden Age of Violin Making in Spain ed. Jorge Pozas (contributors: John Dilworth, Peter Ratcliff, Brigitte Brandmair, Cristina Bordás, Elsa Fonesca and Joan Pellisa; photography by Jan Roehrmann) is due for publication by Trito Editions, Barcelona, in November 2014.